Narrow wooded fairways, some open holes and a few water hazards with many shots requiring control. Some elevation throughout with pins on fast greens. From I-71 exit, go west on Rte 36 for 0.9 miles to a left on Africa Rd. Go south 5 miles to a right at the New Galena entrance. Follow park road to 1st left. Parking for course on the right. This is a nice, challenging course that even novices can be successful on, but one should know ahead of time that at least two holes will bring water into play, and the chance of needing to wade, or to play very conservatively, is significant. That said, the course map is out of date[see my GPS trail at http://www.mapmyride.com/routes/fullscreen/280455963/], and the first tee is in a location that is not even part of the course as shown on the map: across the street and to the north of the small parking lot near the 18th green. Transition routes from greens to tees are not always well-marked, and we and the group ahead of us had difficulty finding one other tee (besides #1) on the front and back nines. Beyond that, the course was fun, and shows real promise. A few holes in the woods are impossibly tight, but they are also not long, so it is possible to score on them, even if an ace may be only a pipe dream. 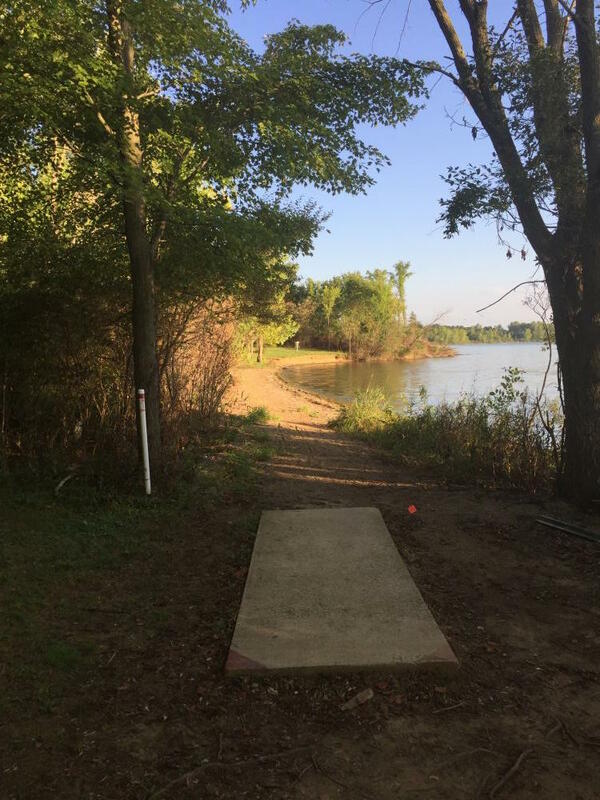 This 1 I'd call a diamond in the rough,needs some grass growth in some areas but I do like the mix of holes,you've got long, short(not too many but they're there),1 good water hole, 1 bad water hole(if you can't curve hard left back into the shore don't even try it= disc eater). Needs a little clearing out but not much,very nice naturey feel. For me the signature would have to be hole 2 which plays over 500 feet(from the am tees) good thing 1 of the obsticles is a water fountain cause you may need it. I wouldn't drive 2 hours for it but I will drive from Cols. to play it again. This feels like a good course just waiting for the tweaks it needs to be great. It is a bit rough with muddy patches and stumps in the trail. It is also a little crowed with the amount of trees in the field of play and needs some, but not many, removed. The water hole is a no play for me when the water level is high. Very little would be needed to make this a 4 for me, but it is not there yet. Course is close to the mountain bike trails, so this is great chance to get in a ride and throw some discs. Many holes are in the trees with tight fairways. All cement tees. Course description says natural. 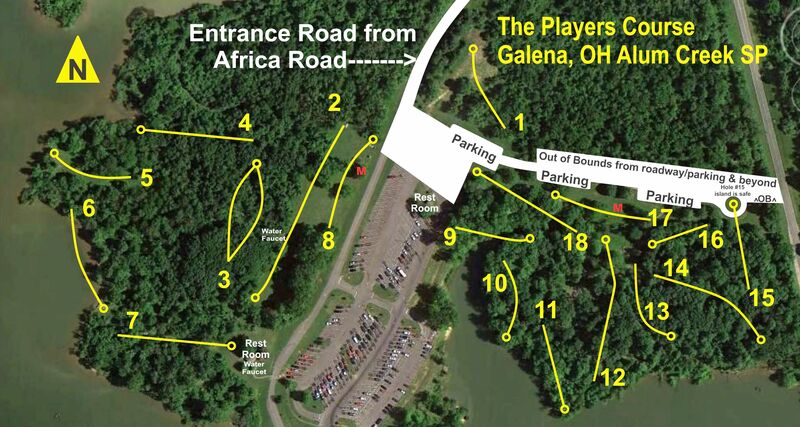 Signature hole has to be the water hole #6, which sits along the lake. 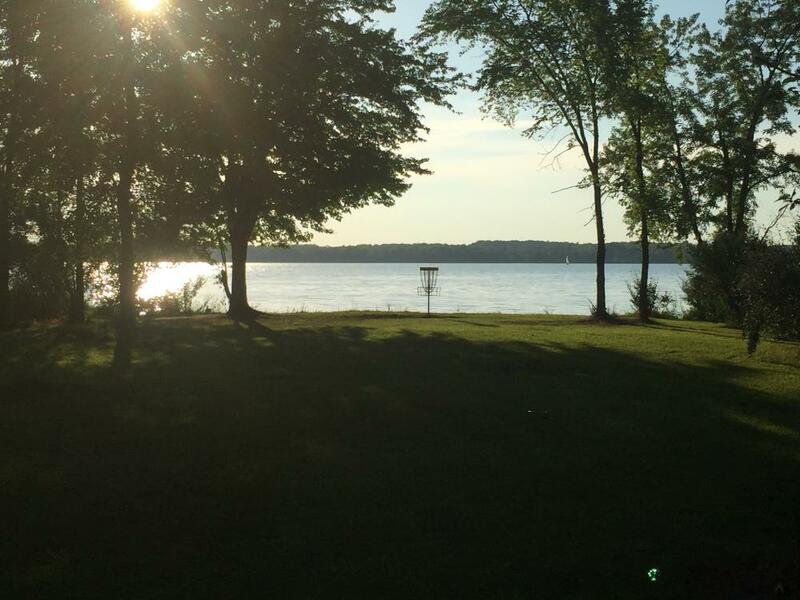 If you fade to the right, plan to lose your disc in the water. Front 9 has some open tee shots, nice to warm up. Back 9 is all in the trees. Parking lot is in the same area as the boat launch, easy to find off Africa Rd.